← Do Snow Days Hurt Math Progress? 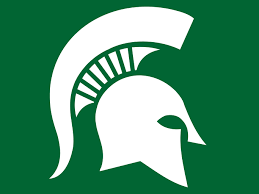 The number seven seeded Michigan State Spartans beat the Louisville Cardinals 76 to 70. They now join an elite group of three number one seeds in the Final Four. This certainly would qualify them as the Cinderella Story of the 2015 NCAA tournament. In their win against Louisville, Spartan Guards Travis Trice and Denzel Valentine combined for 32 points. What percentage of Michigan State’s total score was contributed by these two players? How many points were scored by the rest of team? This entry was posted in Uncategorized and tagged fun math problem, Michigan State, NCAA basketball tournament. Bookmark the permalink.